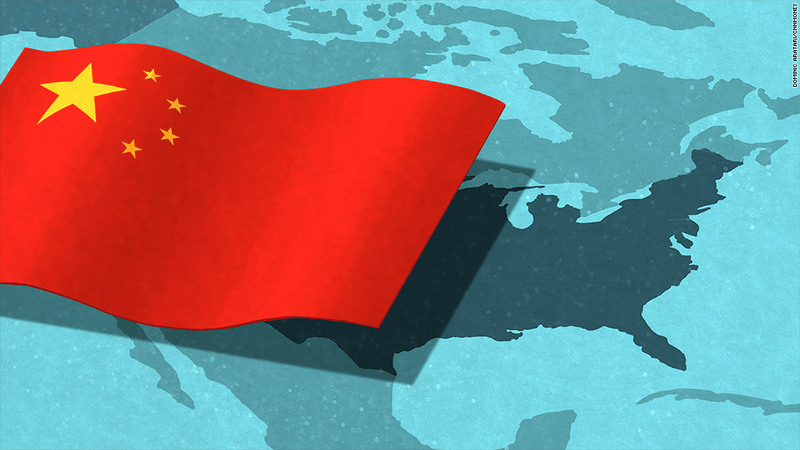 The aerospace and defense giant has a history of close ties to China. Boeing helped develop the country's aviation industry and infrastructure. Xi visited Boeing's factory in Everett, Washington, where it produces the 747-8, 767, 777 and 787 Dreamliners. Boeing also announced that it's teaming with the Commercial Aircraft Corporation of China to build a facility in China to paint and finish the interiors of 737s. Xi said that he wants to continue to grow China's relationship with Boeing, which dates back to 1972. Boeing workers, however, are concerned that will mean fewer jobs in the United States. The Machinists Union in Seattle, which represents Boeing's Washington employees, organized demonstrations outside the facility on Wednesday. They say Boeing is outsourcing jobs. Xi also crossed paths with Microsoft (MSFT) co-founder Bill Gates on Wednesday. Earlier in the day, Xi attended a forum hosted by the Paulson Foundation, an economic think tank founded by former Treasury Secretary Henry Paulson. Xi met with 30 American and Chinese CEOs, including Berkshire Hathaway's (BRKB) Warren Buffett, Amazon's (AMZN) Jeff Bezos, Apple's (AAPL) Tim Cook and Microsoft's (MSFT) Satya Nadella. Also scheduled to be there were executives from Chinese tech giants Baidu (BIDU), Tencent (TCEHY), Lenovo (LNVGF) and Alibaba (BABA). Xi also attended the U.S.-China Internet Industry Forum, where he met Facebook CEO Mark Zuckerberg. Zuckerberg, who speaks some Mandarin, wrote in a Facebook post that "this was the first time I've ever spoken with a world leader entirely in a foreign language. I consider that a meaningful personal milestone." It's been a busy visit for Xi. On Tuesday, he signed a pact with some U.S. governors committing to work with the U.S. on clean energy development. The Chinese government also recently announced it plans to import such technology from America. Xi also said Tuesday that he's ready to talk about Internet security with the U.S. It's a hot topic after a series of hacking incidents have strained relations between the countries, although Xi insists Beijing is not involved. -- Samuel Burke and Kevin Wang contributed to this story. Correction: A headline on an earlier version of this article misspelled President Xi Jinping's name due to an editor's error.